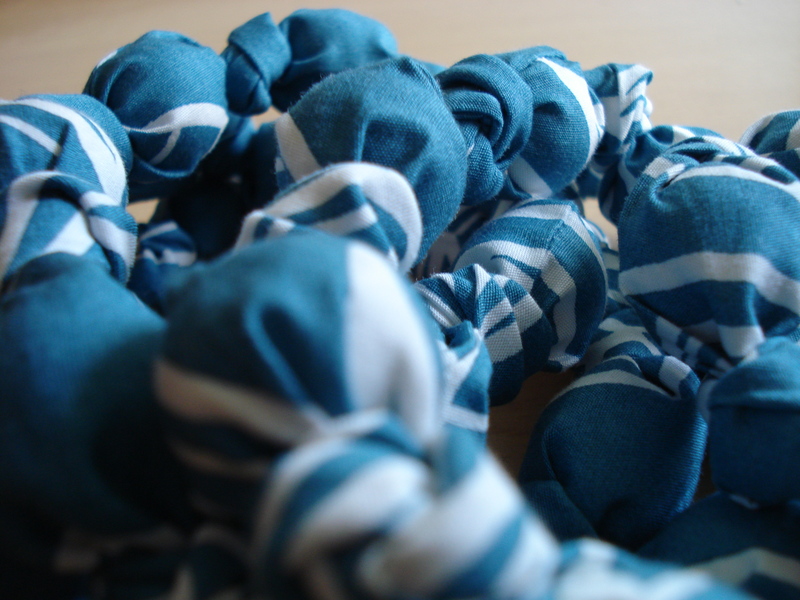 I used one of my favourite fabrics, one of those that has been lying around for quite some time as I never got the chance to make the top out of it that I was planning to do. (I am still at the muslin-testing stage.) It’s once again from Ikea – the blue Josefin variety this time. 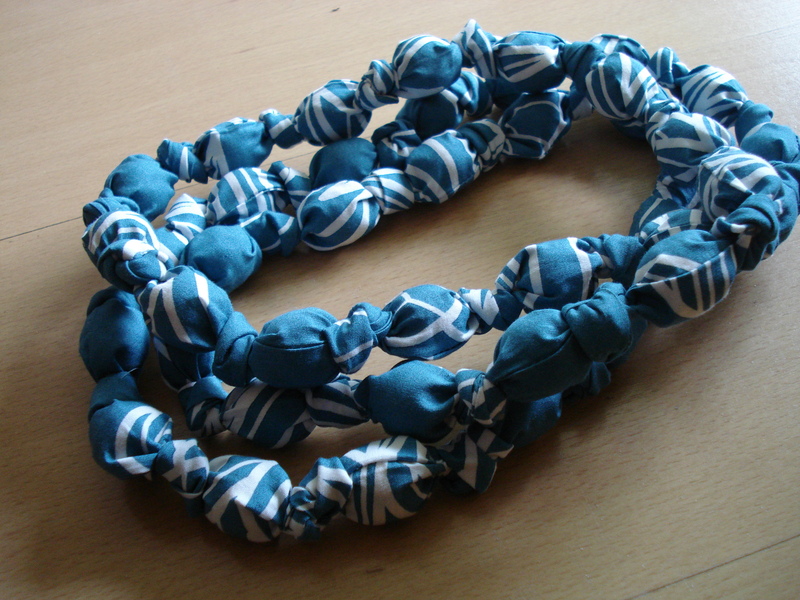 Oh, and of course this necklace was once again inspired by Amy Butler’s fabric necklace. This time I tackled Javajem’s wristlet tutorial. I had my eye on it for quite some time and finally had the time and the reasons (weather + the interfacing I ordered to finish my latest bag project hadn’t arrived from its ebay seller in time for the weekend) to get started. I like the result a lot, although next time I might shorten the strap a little bit and try o find a way to tuck in the raw edges that are still visible on the inside of the wristlet (you don’t really notice it if you don’t know, but I am a perfectionist… 😉 ). Just in time for my Stockholm trip I finished a quick passport cover. I made it following the great tutorial by bunnybum. The fabrics, as usual are from Ikea. The orange Gunilla fabric and the blue Fredrika fabric that sadly is no longer available at my local Ikea (I’ve only got a few scraps left…). I just finished another Messenger Bag following the Hip Mama Diaper Bag Tutorial by A Mingled Yarn. This one is for my brother’s girlfriend. She really liked mine and so I made her one too. This time I adapted the pattern a little bit. The strap is now adjustable (as it was the first time I did that, I followed the tutorial by You SEW Girl). Also, the interior pockets are now lined, so they are a lot sturdier and prettier. I did the same with the back exterior pocket, where I also lined the exterior fabric part, where the zipper is sewn onto. Additionally, I added a key ring to the interior. Otherwise, I used the same fabrics as before: Gunilla (in black/white and orange) by Ikea. Ah, finally I finished my messenger bag, following the tutorial by A Mingled Yarn. The tutorial was really great, taking me through the process step-by-step with lots of pictures. Very easy to understand even for a beginner! I used patterned fabrics by Ikea – the black and white Gunilla fabric for the exterior and the orange Gunilla fabric for the lining. Taking inspiration from Anna Maria Horner’s wonderful Blog I started to organize my sewing threads in glas jars (purchased @ Ikea). P.S. : Fabric by Ikea. 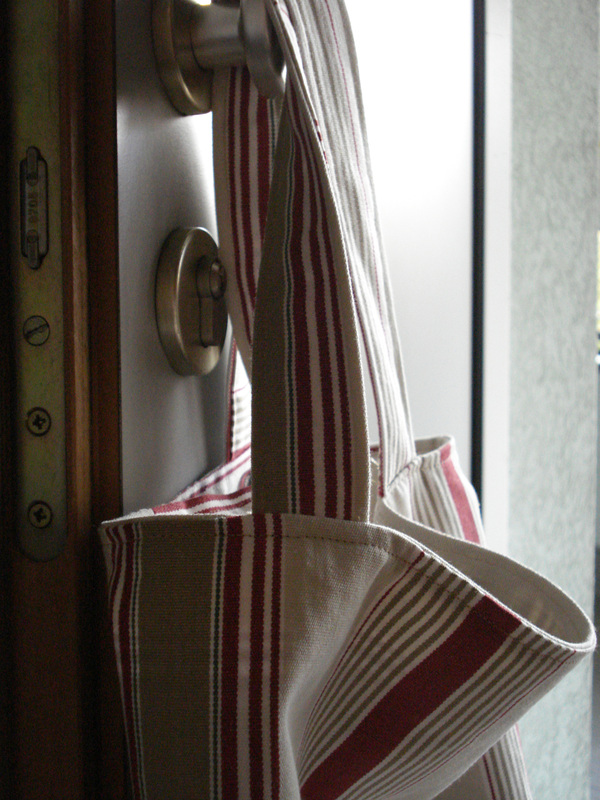 Tutorial used for the shopping bag by Pleasant View Shoolhouse.